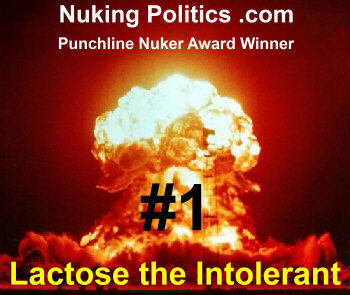 Well, it has been a week since the first official punchline nuker award was given out, and it is time to pick the first weekly award winner. Without further ado, this week's Punchline Nuker Award, with a commanding lead of 6 points, goes to Lactose the Intolerant. We'll have another winner to select next week, so keep up teh funneh. 1 point if you came up with a punchline to one of my straight lines (and I deemed it worthy). 2 points for the best of those.